A simplified diagram of a real hair follicle structure. Hair loss is a common disorder that affects many men and women due to aging or medical conditions. Current FDA-approved drugs can minimize further hair loss but are unable to regrow new hair. The Institute of Bioengineering and Nanotechnology (IBN) has recently engineered a new hair follicle model that could help discover new drugs for hair regeneration1. IBN Executive Director Professor Jackie Y. Ying said, "We have applied our cell and tissue engineering expertise to create a hair follicle-like structure that is very similar to the native hair follicle. This model allows us to better understand the mechanisms that control the development and growth of hair follicles. We hope that our invention would lead to novel ways to treat hair loss, which affects millions of people worldwide." 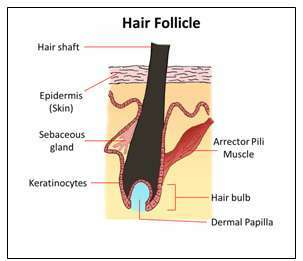 The hair follicle is a regenerating organ that produces a new hair shaft during each growth cycle. This hair growth cycle is controlled by interactions between two main cell types: epithelial cells, which surround the hair shaft, and dermal papilla cells, which are at the base of the follicle bulb. A three-dimensional (3D) hair follicle model would therefore be useful for studying these cell interactions to identify new treatments for male and female pattern baldness. By applying a patented microfiber fabrication technology2 for engineering different cell types in three dimensions, the IBN research team was able to fabricate a 3D hair follicle model that mimics the size and cell arrangement of a real hair follicle. They achieved this by combining two types of hair cells, namely, dermal papilla cells and keratinocytes, an epithelial cell type, within a translucent fibrous matrix. IBN Team Leader and Principal Research Scientist Dr Andrew Wan elaborated, "Measuring the diameter of a strand of hair, our hair follicle-like structure exhibits similar cell behavior as real hair follicles. In our model, the hair cells are implanted into very fine and transparent fibers, which can be easily examined under the microscope unlike conventional models, making them ideal for drug testing applications." The IBN researchers found that the cells in their hair follicle-like structures switched on genes that are usually active during the hair growth stage, and when transplanted into mice, they could grow further into natural-looking hair structures. If commercialized, this technology could be used by pharmaceutical companies in the drug discovery stage to screen potential promoters or inhibitors of hair formation. Consumer care companies would also be interested in this technology platform as it would allow them to screen the effectiveness of active ingredients in personal care products for hair growth.